TCTS process consulting team has vast experience in similar assignments across the globe and have brought in standardisation across business processes thus helping telecom operators in their operations. TCTS' process consulting practice applies industry best practices, leverages proven framework, re-use processes and execute best-in class tools. TCTS's strategy on process consulting focuses on achieving excellence and measuring benefits that ensure desired outcomes. TCTS process team will conduct workshops with key stakeholders across business and customer process team to understand the requirements. These requirements will be considered while enhancing the as-is processes defined by client’s team and to design processes. TCTS team would do a qualitative as well as quantitative assessment of the process to identify improvement areas and come up with recommendations. The process would be analysed quantitatively based on the performance metrics like KPI/ SLA/ OLAs data, process performance dashboards. This would provide visibility of performance improvement areas, process delays and bottlenecks, complexity of operational model, if any. 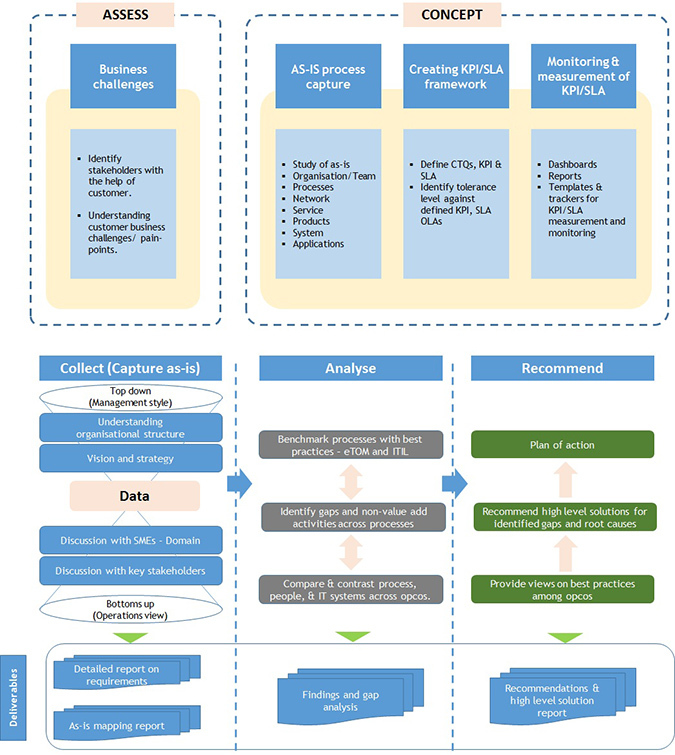 With respect to the recommendations, a low level solution map is created based on which to-be process will be modelled. The detail benefit calculation is performed on each of the recommendation suggested. TCTS consultants would engage with customers to conclude recommendations on improvement areas. Prioritisation of the improvement recommendation would be provided based on their impact to the customer – both from short term and long term business objectives. Recommendation is evaluated with the customer SMEs by carrying out live run observation. A detailed change management document is prepared to capture the changes in the process.